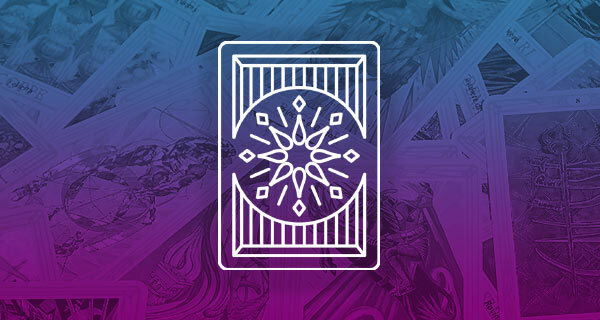 This week we will revisit the amazing resource, “The Ultimate Guide To Tarot” by Liz Dean. There is so much rich material in her book on each Major and Minor card. She does read reversals, and so I will include those in this week’s reading. 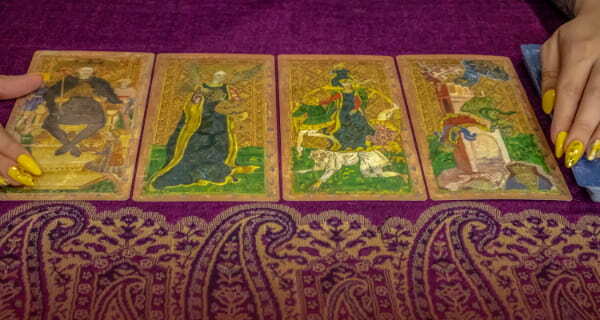 So let’s begin your weekly tarot reading! Day (#0, The Fool): The Fool is the innocent adventurer about to begin an important journey. His Wisdom Message: Leap, but look first. Home: The Fool can mean a young person leaving home for the first time. Also, surprise visitors could call. Relationships: There’s a new relationship. Go with the flow at this point. Career and Money: You may have a new opportunity in your current job or a new career to look forward to. Evening (Nine of Swords [Reversed]): Liz calls this “the 3 a.m. card” as it’s what you wake up worrying about in the wee hours of the night or when suffering from an illness. Being reversed, the meaning is more extreme and means despair, guilt or feeling trapped. However, this is the lowest point of the cycle, and these feelings will begin to shift. Therefore, be patient and compassionate with yourself and turn to others for support. Day (Death [Reversed]): His Wisdom Message: Swift change brings new beginnings. Home: You need to find a new home, as the place you’re living in no longer meets your needs. You have the opportunity to relocate. Relationships: This card can indicate that a relationship ends or there is a period of necessary separation on the horizon. Career and Money: New opportunities are on the horizon and money matters will improve. Reversed, you may feel anxious and stressed. You are unable to understand what is happening. Here, the Universe is telling you that there is no way back to the relationship or the job you had. Evening (Three of Swords [Reversed]): In its upright position, the Three of Swords reveals the pain of truth. When reversed, the upset is accompanied by quarrels and drama. However, the upside is that feelings will be expressed so some of the pain and confusion will be released. Those around you will understand your need to vent. Day (The Hanged Man [Reversed]): His Wisdom Message: Use your time wisely. Home: Waiting and delays may affect remodeling and moving. Relationships: You are unable to get the commitment you want. Career and Money: Hold back on signing contracts or dealing with legal matters just now. Reversed, The Hanged Man can be a sign of rigid thinking and martyrdom. You may need to revise your expectations—what you think you want may not be possible. Are you hanging on to a fantasy that may make you a victim rather than a victor? Your weekly tarot reading encourages you to liberate yourself from a contract that cannot offer you what you want. Evening (The Hierophant): The Hierophant shows support, self-realization, and expansion. His Wisdom Message: Make the most of your gifts. Home: It’s time to expand your current property. Invite people into your home to share your interests. Relationships: This card suggests committed partnerships or marriage. Therefore, it’s time to celebrate what’s sacred in your relationship. Career and Money: Progress, direction, and decisions. Inspired leadership and growth. Day (Three of Cups [Reversed]): Here we see three maidens raising their cups in a joint toast. They appear to be dancing and celebrating too. When reversed, the Three of Cups can indicate a flirtation or indulgence gone too far. This includes affairs and heated emotions. In committed relationships, there may be distance and a lack of understanding. It may also indicate creative blocks. You may suffer from a lack of motivation and support. If so, take a break and get grounded. Evening (Temperance [Reversed]): The Wisdom Message: You are guided to find peace. Home: Running a household and working is a fine balancing act, but you have the financial and emotional resources to succeed. Relationships: You are able to reach a new level of trust. 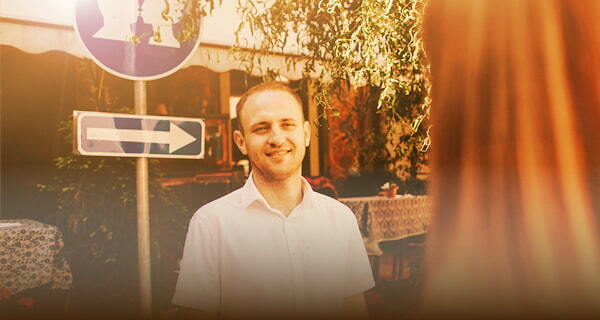 If single, you may be guided towards a new partner. Career and Money: You may be dealing with difficult or highly sensitive individuals. Therefore, be the diplomat, and you can work a miracle. Temperance reversed shows imbalance and unfairness in relationships and problems with money. What you pour into your relationships and work isn’t rewarding. 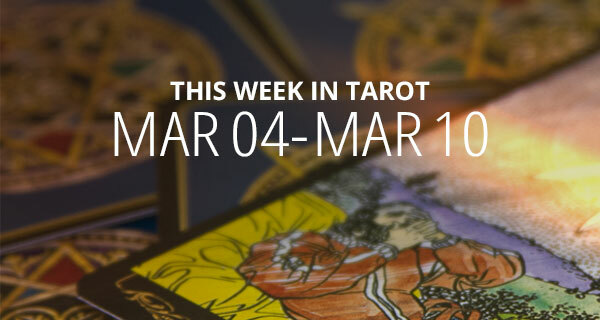 Your weekly tarot reading encourages you to try to look at what you need now. Day (Six of Swords): The Six of Swords is one of the more positive Sword cards. It shows you moving on from a situation or relationship and enjoying a period of peace and harmony. You are distancing yourself from drama and complication. In work, the card can show travel as part of your role, and in relationships, this card shows two people spending time apart. It can also be interpreted as a relationship ending. It shows that you are taking a break from work or your usual environment, and you may travel. Evening (Knight of Cups): The key meaning of this Knight is a proposal, as his quest is for the holy grail of love. As an influence, this Knight heralds an emotional time. You may be bewitched by a new love interest or enjoy more romance, beauty, and nature. As a person, this Knight is idealistic, dreamy, artistic, and sensitive. He wants a relationship but may find it hard to articulate his true feelings. He may also be stuck behind a persona of the perfect partner, but may not be able to drop the act to let you see who he really is. Day (The High Priestess): Her Wisdom Message: Explore your spiritual side. Home: It’s a quiet time. Family relations may be calm, but a little distant. Relationships: This card can mean being single for a time. Or, you and your partner choose to keep a part of your life separate or secret. Career and Money: Success is coming, but contracts and new work are taking time to develop. You can only be patient. Evening (Ten of Cups): The Ten of Cups reveals the benefits of love and the security of a family. It favors children as an expression of love and often reveals that children will do well socially and academically. In relationships, this is an emotional time but in a positive way. Partnerships built on stability and trust become even more rewarding and supportive. There may be weddings, parties, and other significant celebrations. This card also indicates prosperity as a result of achievement. Day (The Chariot): Its Wisdom Message: Take charge and reach for the stars. It signifies success and a time for determination and focus as you travel in a new direction. Home: Travel away from home is the focus now. You may also welcome travelers from other states or countries. Relationships: A relationship progresses at a steady pace. Or, you may be moving on alone but this is your rightful path. Career and Money: Swift progress in business affairs. The opportunity coming your way will be challenging and exciting. Financially, you are on the road to success. Evening (The Magician): The Wisdom Message: Manifest your desires. It’s time for action and for communicating and expressing your ideas and desires. It’s time to broaden your horizons and to take new, creative approaches. Home: A house sale is completed or you decide it’s time to move forward with remodeling plans. A sociable evening is on the horizon. Relationships: If you are single and want love, it’s coming. If in a relationship, you will begin to see commitment. Career and Money: There will be a new beginning. You will either find new employment or a new direction in your existing work. Why can I Be happy&Chou at time I just want to be free of my family & evil that’s In my life help me. I just wanted to express my love to all and my gratitude 4 All of the shared wisdom knowledge and mostly the caring This truly tells me that your genuine. I had recently been finding out that I am an empath and there’s more to it than that a Gemini I definitely know now that I was born to do something that I’m capable of and that is yet to be seen because I live by a motto I’m good at what I do and what I’m not good at I haven’t done yet I can go rambling on cuz I am a Gemini but I’ll just say thank you. PS I need some kind of coaching or something I think cuz I have nobody to watch my back or we can say not supporting my any of my decisions cuz I am at a Crossroads.